The fourth edition of the Gulf Business Industry Awards took place in a glittering ceremony at The Westin Mina Seyahi Beach Resort & Marina on Tuesday, with some of the biggest business leaders from the United Arab Emirates in attendance to applaud excellence in the corporate world. A total of 26 awards – judged by an independent panel and public voting – were given away during the evening. The awards commemorated companies and business leaders across nine industries including aviation and transport, banking, healthcare, energy, technology, real estate, retail, media and marketing, and tourism and hospitality. For his outstanding achievements and contributions, the founder and chairman of the UAE-based conglomerate Easa Saleh Al Gurg Group, H.E. 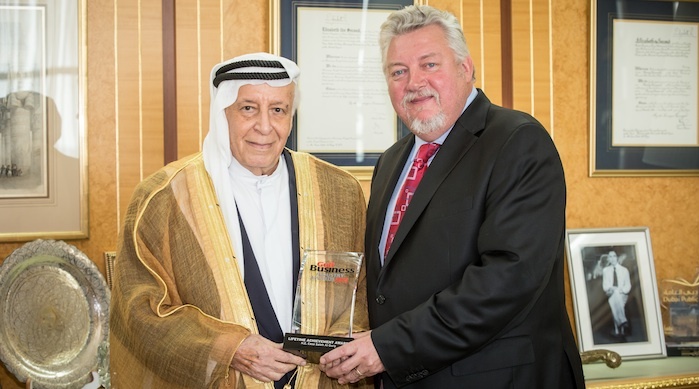 Easa Saleh Al Gurg was bestowed with the prestigious Lifetime Achievement Award for 2015 (pictured above). The coveted UAE Company of the Year award was bagged by developer Emaar, while Emirates Airline president Sir Tim Clark was handed in person the 2015 Business Leader of the Year award. The publicly voted Entrepreneur of the Year award went to co-founder and CEO of Souq.com Ronaldo Mouchawar. The GBIA independent judging panel included: Huda Al Lawati, Abraaj Group MENA partner and chief investment officer; Husam Hourani, Al Tamimi & Co managing partner; Y.S. Shashidhar, Frost & Sullivan MENA managing director; Ian Fairservice, Motivate managing partner and group editor-in-chief and Dean Carroll, Motivate group editor (business division of titles). The evening was hosted by Motivate Publishing along with the Dubai Chamber of Commerce, in association with Audi, our official car partner and category sponsors: Moorfields Eye Hospital, RAK Free Trade Zone, Aafaq, Jacobsons Direct Marketing Services, Rashid Printers, Bliss Flowers, Yalla Seyarah and The Westin Dubai Mina Seyahi Beach Resort and Marina.